The Valon 5015 uses multiple phase-lock loops to provide high-level, low-phase noise signals throughout the 10MHz to 15GHz range. Our synthesizers often replace laboratory generators costing many times more. They are rugged, reliable and versatile, and deliver a breakthrough combination of cost and performance. 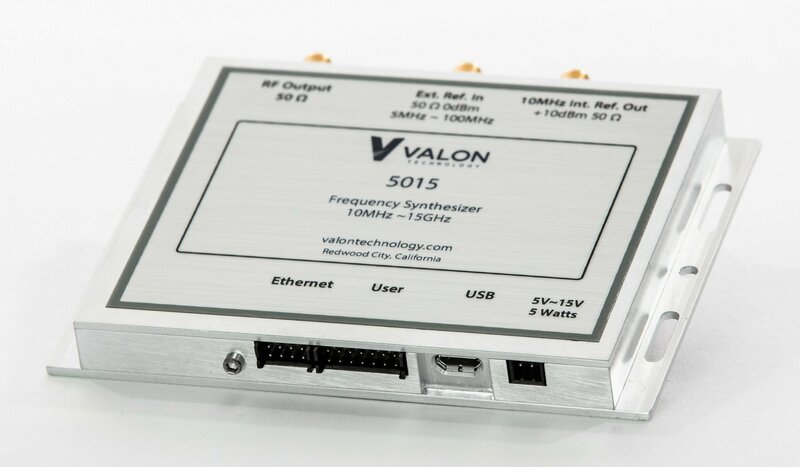 Valon Technology, an innovator of radio frequency products for wired and wireless applications, announced the availability of the Valon 5015 wide-range frequency synthesizer module. Designed for use in critical frequency synthesis and clocking applications, the Valon 5015 uses multiple phase-lock loops to provide high-level, low-phase noise signals throughout the 10MHz to 15GHz range. Designed and manufactured in California, Valon’s range of frequency synthesizers are perfect for a wide variety of applications that require a spectrally pure and highly stable signal source or timing clock, such as wireless engineering, point-to-point microwave communications, electro-optics, molecular spectroscopy, particle physics, and radio astronomy. Uses multiple phase-lock loops to provide exceptionally low phase noise over the 10MHz to 15GHz range. High RF power output across a wide frequency range >13dBm, typically 15dBm. Incorporates an efficient switching power regulator allowing for an input voltage range from 5 to 15 volts. Versatile communication interfaces: USB, Ethernet, SPI, and TTL Serial. Rugged design coupled with Valon’s proven design and testing methodology ensures high reliability for the most demanding applications. The Valon 5015 frequency synthesizer costs $1,795 plus shipping. First customer shipments will commence mid-June. Volume pricing is available on request. Visit ValonRF.com to learn more, request a quote, or place an order. Valon Technology LLC designs and manufactures innovative RF and microwave products for science, industry, defense and academia. The firm’s product design portfolio encompasses a variety of special products such as high dynamic range transceivers, radar front-end modules, high-power industrial amplifiers, and various short-range data and security devices. Valon is committed to total customer satisfaction, superior product quality, and exceptional customer service. Founded in 1987, Valon Technology is headquartered in Silicon Valley, California. For more information, visit ValonRF.com. 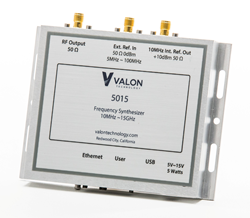 The Valon 5015 features versatile communication interfaces: USB, Ethernet, SPI, and TTL Serial.